Well i guess that's something to tell the grand kids. The western stand at the Adelaide oval is just being built in the current google aerial pic of the city. Apparently Google Maps are starting to roll out a NearMaps-like time line feature which will allow users to wind back the clock to see how the overhead shots have chnaged over time. monotonehell wrote: Apparently Google Maps are starting to roll out a NearMaps-like time line feature which will allow users to wind back the clock to see how the overhead shots have chnaged over time. That would be great, I use to enjoy the Near Maps till they started to charge. They are, but not for satellite shots - it's for street view. Saw one in Renmark two days ago. The time-reverse feature has been available in Google Maps for several years for overhead views. If you meant that they're going to include it for streetview now that will be a great new feature. pushbutton wrote: The time-reverse feature has been available in Google Maps for several years for overhead views. If you meant that they're going to include it for streetview now that will be a great new feature. Yep, that's exactly what it is. You can now switch between the street view images of 2007, 2009 and 2013. Helpful if you want to see what was demolished for a building development or something like that. I'm surprised they didn't implement this earlier, because it's a great feature. More new Street View. Only appears to be on King William Street's western side at the moment, but it's from November 2014. Projects like Vue and 115 KWS are beginning, and the completed CML jewel box, Quest KWS South, Adelaide Oval and footbridge can now be seen. Hopefully it's not just KWS and hopefully the street view updates continue to be done annually. 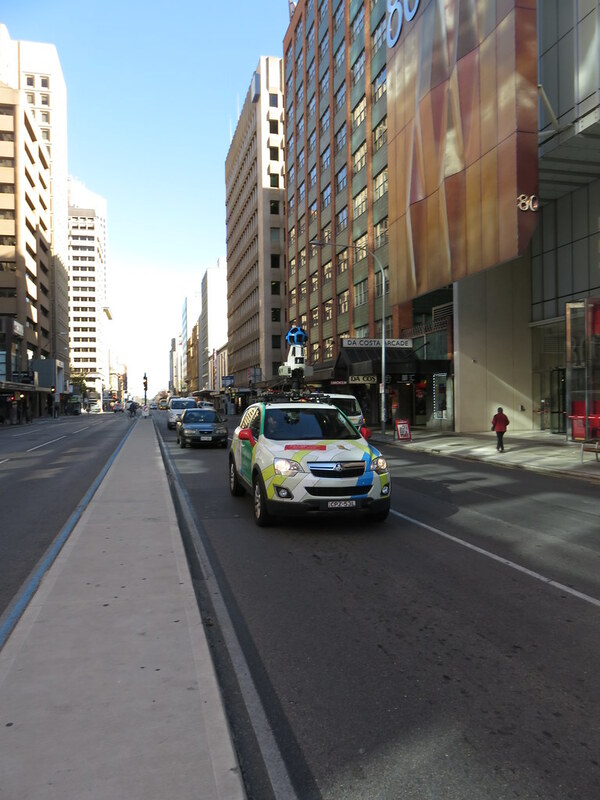 There's some more new Street View from Mid-Late 2016 if you're interested. This week, I saw it on Marion Rd in Park Holme whilst on bus 1104 going to Marion. Hopefully I might be able to see that bus when it becomes available. I was walking through the long term carpark at the airport and I saw it. Here's me from last year on Grenfell St! Actually really impressed with you doing this! Great work! You’re famous!